It could be that the pH is too high or too low. It is hard to image that it could be so different with the two palms growing so close together but it is worth testing the pH to rule it out as a cause. It could be compaction which can affect root growth. Limited root growth can cause limited nutrient uptake. It could be that the area is too wet. Is there poor drainage? A leak in the irrigation? Drain pipe directed towards the plant? Roots need oxygen in the soil and if the soil is waterlogged, roots cannot perform correctly and uptake nutrients. It could be that the palm is planted too deep. 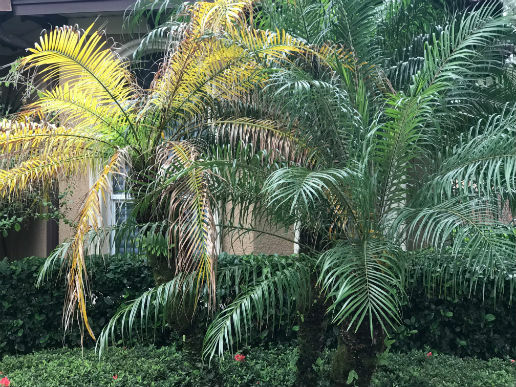 Palms planted too deeply usually exhibit symptoms of root suffocation such as chlorosis from iron or manganese deficiency, wilting, shriveling of the trunk, reduced canopy size, root rots, and ultimately death. Deep planting results in reduced root zone oxygen levels, which in turn reduces root respiration rates and ultimately the effectiveness of the root system in taking up nutrients and water. In this case, a pH test and examination of the roots showed that on one side of the palm, the pH was 3.6 and there was minor root development. On the other side of the palm, the pH was 4.8 with robust root development. There was also a very heavy mulch layer along the front side of the grouping. My recommendation: The low pH could be causing a nutrient deficiency. I recommend raising the pH with dolomitic lime, which provides magnesium, at the rate of 5 lbs per 100 square feet (to raise pH 1 point). Continue with the UF recommended fertilizer, 8N-2P2O5-12K2O +4Mg with micronutrients with 100% of the N, K, and Mg in a slow release form. Also, remove the heavy layer of mulch to expose the root initiation zone. Since the palms have been regularly fertilized and the new growth is green, I would watch the palm this spring. Maybe it can turn around. I wouldn’t recommend pruning at this time. ← UF/IFAS Extension Needs Your Help!